BEYONCÉ ANNOUNCES ‘THE FORMATION WORLD TOUR’ Tour Dates Below!! The North American leg kicks off April 27 at Marlins Park in Miami, Fla. and travels to stadiums throughout the country including New York City, Los Angeles, Chicago, Toronto, Philadelphia, Dallas, and more. The European run will commence on June 28 in Sunderland, U.K. at Stadium of Light. Additional European stadium dates include London, Manchester, Zurich, Amsterdam, Paris, Milan, Stockholm, Frankfurt, and more. 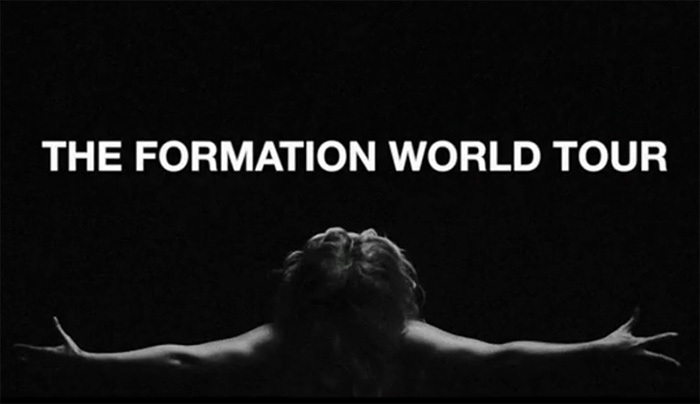 The tour borrows its name from her new single and video “Formation” which debuted on Saturday (Feb. 6). Pre-sale tickets go on sale Feb. 9 with a general on sale Feb. 16.